Thailand is divided up into four main regions: south, central, northeast, and north. This division is made due to multiple factors, including significant geography aspects, language differences, historical differences, and economic differences. In Thailand the four major dialects of Thai are: Central Thai, Thai version of Lao which is called Isan (we have two videos of Isan lessons), Southern Thai and Northern Thai language. Many people say the southern dialect is spoken the fastest among the four dialects (but I have some Isan friend who speak faster than southerners), and the locals like to shorten words to single syllables, and shorten sentences to one or two words. My mom is from Nakhon Si Thammarat. I grew up here therefore I understand southern dialect though I can’t speak it well because my dad is from the north (Phichit), so in our family we speak central Thai (also in schools). Not being able to speak southern dialect is something I regret because local people speak the local dialect. When they speak southern dialect (ภาษาใต้ /paa-săa dtâai/) to me and I respond back in central Thai, I feel pretty awkward. 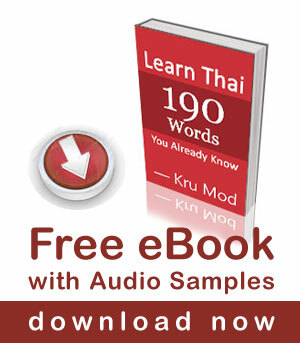 In this video my mom shows you what southern Thai dialect sounds like. Please bear in mind that the accent can be varied in different parts of the south region. If you go to Pattani, Narathiwat and Yala, the dialect is different, it is known as je he (เจ๊ะเห) or the Tak Bai dialect. Accoridng to Wikipedia, Southern Thailand is a southernmost cultural region of Thailand, separated from Central Thailand region by the Kra Isthmus (the narrowest part of the Malay Peninsula). There are 14 provinces in south region. 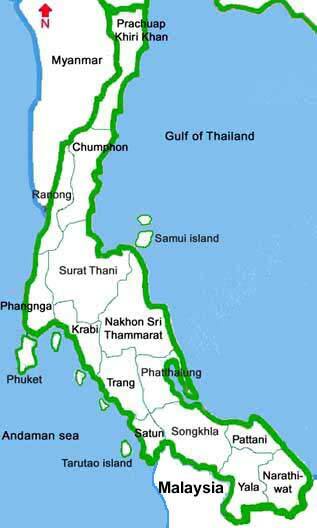 Chumphon,Surat Thani, Phangnga, Krabi, Nakhon Si Thammarat, Phuket, Trang, Patthalung, Satun, Songkhla, Pattani, Yala, and Narathiwat. บายดีมาย /baai dii maai/ How are you? 2. พันพรือมั่ง /pan prue mâng/ How are things? 10. แขบๆหิดตะ /kàeb-kàeb hít dtà/ = hurry up! Thanks for let me hear again these words. I knew them already because I have friends in Sichon near Nakhon Si Thammarat but it’s a long time I spoke them. the kind girl speakinf, she is single? Because I am ready to love and merry her. Great! Kru Mod, thank you very much for this and all the other lessons and videos you’ve done. So, you have a video on the southern dialect and I remember another one you did with Kru Pear about the Isaan dialect but do you have one on the northern dialect? I live in Chiang Mai and I would love to learn more of it.